Don’t you just hate it when you get home after purchasing a new nail varnish only to discover that it either goes on like glue or has the consistency of water. I find it really frustrating when that happens and the colour looks nothing like it does in the bottle or makes you look washed out. If I use a certain shade of mushroom I look like I’ve been dug up! That’s why when OPI release their minis for the season ahead I get really excited. You get to try the hottest shades of a good quality varnish but at a fraction of the price and you can experiment with colours you wouldn’t have necessarily of chosen. I spent the Summer having a full on love affair with ‘Aloha’ from their Hawaii Spring / Summer 2015 Collection. I just adored that shade! So good. This ‘Fall’ (Autumn for us Brits) / Winter 2015 collection is just as lovely. There are four colours in the ‘Little Bambino’ collection. The lightest of the collection ‘Great Opera-tunity’, is a peachy colour which has a thick coverage so think just two coats of this is suffice. It’s very wearable for a daytime look if you didn’t want to be too dramatic. The second paler shade is a little glitzy which, if I’m honest, I wouldn’t have picked up had I been buying individually however it goes on so blooming lovely and is a gorgeous shimmery copper shade called ‘Worth a Pretty Penny’. Very pretty. Given that it’s the Autumn / Winter range I was very happy to see a bright red. I must admit I think there’s nothing more elegant than a bring red (non-chipped) nail. 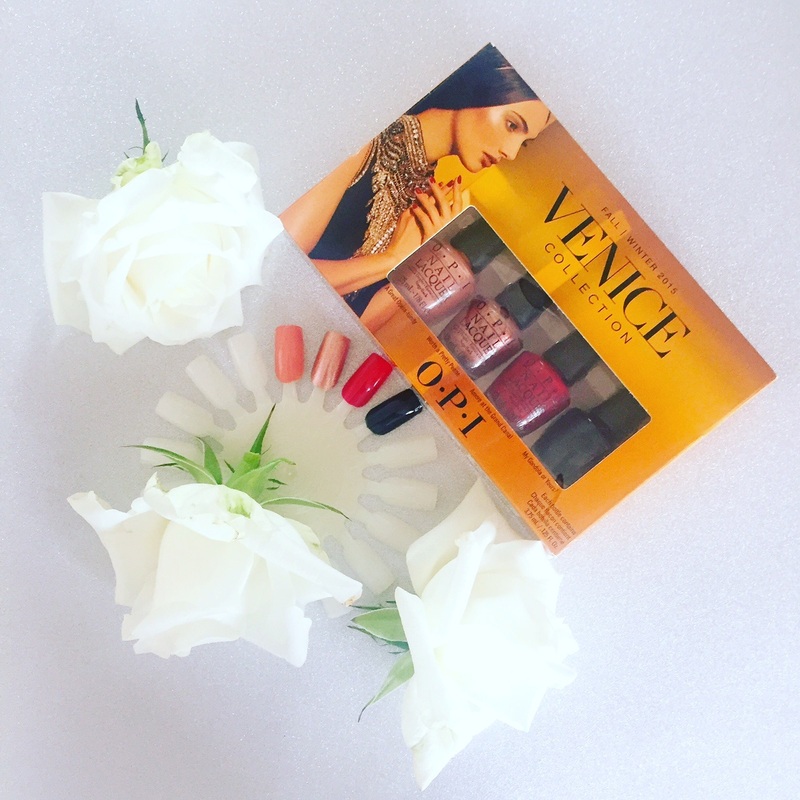 Such a beautifully classic shade, ‘Amore at the Grand Canal’. Finally there is a black shade, ‘My Gondola or Yours?’. I really like this colour and think it looks wonderful on although I wasn’t so impressed by the consistency of this one. I think when you have a darker nail the more opaque the better and unfortunately it takes around three coats to get this the correct shade. Never the less it is a beautiful colour. 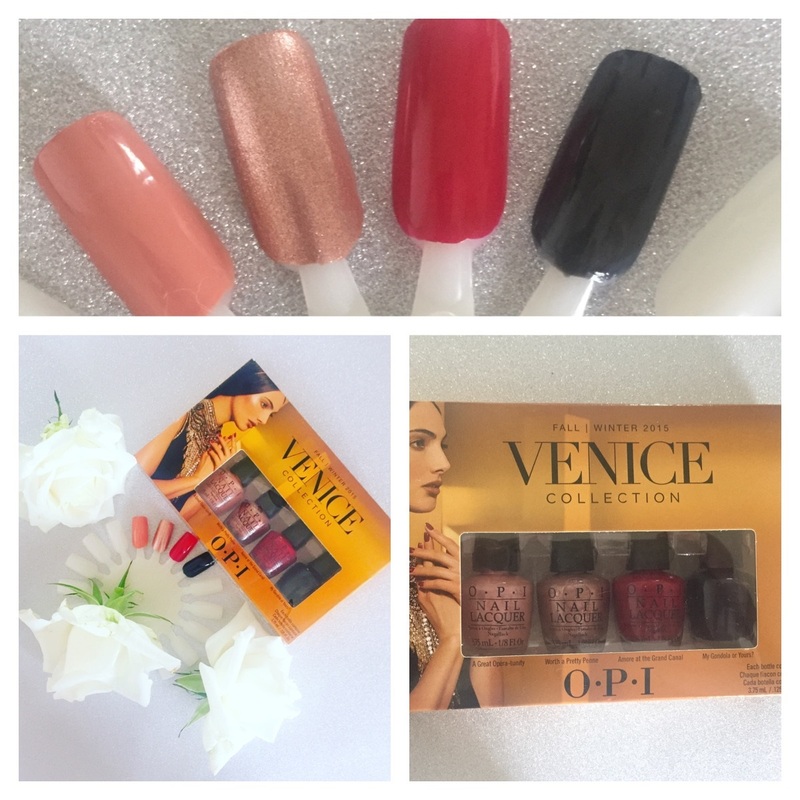 Have you tried the OPI Venice range? What did you think?